Mrs. Farah Zulqurnain is a visionary team leader with over fourteen years of field and research experience, seeking to deploy knowledge and expertise in Clinical Psychology, Early Childhood Education, Mother-Child Care and Women Support areas in a professional and mission oriented environment. In view of limited seats available, prior registration for this workshop is mandatory. Kindly confirm your participation latest by Friday, October 24, 2014 (by 12:00 noon) at registration@ptan.org or (36826991-94/36347611-14 Ext. 8554/8556), as this will facilitate us in organizing the workshop effectively. Universal Children’s Day is celebrated in many countries of the world on November 20, the date when the convention on the rights of the Child adopted by the United Nations General Assembly in 1989. Commemorating this day, Association for Social Studies Educators and Teachers (ASSET) organizes special event for children every year. This year we are organizing Career Guidance session for students on Saturday, November 15, 2014. Individual careers will always be a delicate matter where people must carefully plan, where they envision themselves, or how they see themselves now and after some years from now. Career planning can be a challenging task as individuals are faced with many choices, changes, and obstacles. Studies show that career guidance and counselling help individuals to acquire the knowledge, skills and experience necessary to identify options and planning a successful career path. Sadiq Merchant is an entrepreneur and a teacher by profession with more than twenty five years’ experience in teaching, learning and teachers’ training. He is serving in MSB Educational Institute Karachi for last 25 years in various capacities. He is a part of various training programmes at PTAN (Professional Teachers Association Network) based at AKU-IED Karachi. His passion for learning and teaching has enabled him to create the capacity of empowering teachers/students in order to develop and sustain their learning capabilities. He also has an extensive experience in various academic areas, especially in Mathematics and Social Sciences. He did his First Bachelor in Science. Later he did his Bachelors and Masters in education from HAMDARD University. He has presented research papers at various educational conferences across Pakistan. Career guidance is one of his specialties; and he has conducted more than a dozen workshops and seminars on the topic. Salman Khimani has done his Bachelors in Computer Science and Masters in Business Administration (MBA) from Institute of Business Administration (IBA), Karachi. He has been associated with Aga Khan Development Network (AKDN) for over 11 years. During these years, he has served as the Head of Careers and Scholarship at Aga Khan Education Service, Pakistan (AKES, P) and as the Programme Lead for Aga Khan Foundation's Civil Society Resource Centre. His areas of expertise include career guidance and advising, project designing and management, monitoring and evaluation, training and development and teacher education. He also has a Certificate in Teacher Education from Aga Khan University Institute for Educational Development (AKU-IED). He has conducted over 200 workshops for students across Pakistan on Career Guidance and Life Skills. He is currently the Head of Community Programmes at AKES, Pakistan. The session is open to all students and teachers of Pakistan. Each group of students must be accompanied by a teacher from the school. The session will be held at Aga Khan University, Institute for Educational Development (AKU-IED), Karimabad (IED-PDC, 1-5/B-VII, F.B. Area, Karimabad) on Saturday November 15, 2014. The session will start on time at 9:00 a.m. and end at around 1:00 p.m.
Schools are requested to send in the duly completed registration form (attached) latest by Tuesday, November 11, 2014. The registration form must be completed in all respects and the names of the students nominated by the schools must be clearly spelled and presented in CAPITAL letters. The forms must be submitted along with the Registration Fee at PTAN Office, IED. A token of Rs. 600/- (Six hundred only) is payable as registration fee and must be attached to the registration form either in cash or in the form of pay order in the name of The Aga Khan University. Ms. Asma Mamsa is an educator with focus on teaching Mathematics in primary classrooms. She is currently doing her Masters in Education at AKU-IED. Prior to enrolling in the M.Ed. program she did her B.Sc. in Mathematics and MBA in Finance. She recently completed a research project titled “Formative assessment classroom techniques and their influence on the instructional practices of primary school mathematics teachers” using action research methods. We would like to iterate that in order to provide quality professional development to all valued members and to run this association effectively we need your full support and punctuality. Since seats for the session are limited, interested members are requested to kindly confirm their participation latest by Thursday, October 23, 2014 (by 4:00 p.m.) at registration@ptan.org or 36347611-14 / 36826991-4 Ext. 8556/8554, as this will facilitate us in organizing the workshop effectively. · Emphasize on the importance of inter linking subjects of polity, law, culture, philosophy and alike with traditional subject areas of social studies (civic studies, geography and history). · Use various means (especially activities) to convey conceptual knowledge related to the subject. · Suggest viable alternatives in case of encountering paucity of resources within classroom. · Reaffirm that learning is a two way process, whereby they need to consistently update the stock of knowledge and evaluate his/her experience. Mr. Ajay Pinjani did his bachelors in Political Science and International Relations with a High Honors from Middle East Technical University, Turkey. He attended Boston University, USA under a student exchange program. He completed his masters in Social Work from Tata Institute of Social Sciences, Mumbai and was awarded Best International Student. He has also been an active member of dance and theatre groups during college years. As his master’s thesis project, he undertook research in “Sindhi Sufi Poetry in contemporary Pakistan; meeting of tradition and modernity.” Presently, he is working as a Content Developer, Outreach Tours at Citizens Archive of Pakistan. In view of limited seats available, prior registration for this workshop is mandatory. Kindly confirm your participation latest by Thursday, October 23, 2014 at registration@ptan.org or call 36826991-94/36347611-14 Ext. 8554/8556, as this will facilitate us in organising the workshop effectively. ASSET- Career Guidance session on "Making Choices and Decisions in Career Path" which is supposed to be held on Saturday, October 18, 2014 has been postponed due to rally being organized by a political party same day (i.e. October 18, 2014) in Karachi. New date of the session will be Saturday, November 15, 2014. Universal Children’s Day is celebrated in many countries of the world on November 20, the date when the convention on the rights of the Child adopted by the United Nations General Assembly in 1989. Commemorating this day, Association for Social Studies Educators and Teachers (ASSET) organizes special event for children every year. This year we are organizing Career Guidance session for students on Saturday, October 18, 2014. The session will be held at Aga Khan University, Institute for Educational Development (AKU-IED) on Saturday October 18, 2014. Schools are requested to send in the duly completed registration form (attached) latest by Wednesday, October 15, 2014. Greetings from Human Development Programme- Aga Khan University, Karachi! 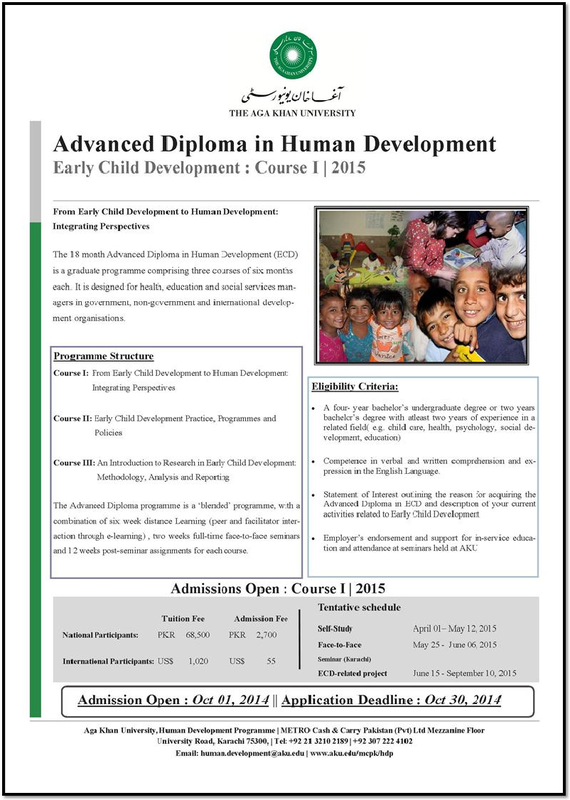 This is to share with you that HDP is inviting applications for Advanced Diploma in Human Development (Early Child Development) Programme, commencing from April 2015. An 18 months Diploma comprises of 3 courses that would be useful also for community development workers and planners who are concerned with home-based or community-based programmes for pregnant women, young children and their families in health care and education settings. We request you to please disseminate to whom you think would be interested to apply on diploma programme. The detailed information about course I is appended below. On behalf of EYLA Executive Committee, we would like to invite you for the EYLA workshop to be held on Saturday, October 11, 2014. · Assist teachers/care givers to help their children in building rich vocabulary, and in turn, strong reading and writing skills. Timing :From 9:00 a.m. – 1:00 p.m.
Saniya Muhammed Saleem is an Early Years trained teacher and has experience of working with young children. She has also done diploma in Montessori Education from London Montessori International. Currently doing her Masters of Education from Aga Khan University- Institute for Educational Development and working on research in early writing skills. Nadya Akram is an Early Childhood Educational Development (ECED) graduate from Aga Khan University, Institute for Educational Development. She has been working with early year’s teachers and young children for last ten (10) years. She has also worked as an Academic Coordinator in private schools. As a teacher trainer she has conducted workshops on early years education for various organizations. Registration will start from Friday, October 10, 2014 at 8:30 a.m. Since seating at the workshop is limited, aspiring participants must confirm their participation at registration@ptan.org or phone # 36826991-4/36347611-4 Ext. 8554/8556. Available seating will be assigned on a first-come, first-served basis, and the registration will be closed once the workshop has been fully subscribed.